Smoking can increase risk of lung cancer in men and women, but researchers from George Mason University in Virginia focused on the impact of smoking on maternal respiratory function and fetal health in a study published in Southern Medical Journal. The study reviewed more than one million medical records via North Carolina birth and death files. Researchers found a direct connection between smoking and respiratory issues in pregnant women when medical records were compared to non-smokers. Smoking women experiencing respiratory issues were more likely to give birth to an infant of lower than normal weight. Risk of preterm delivery, fetal distress and infant death were also greater in the smoking group. Respiratory issues also accounted for increased likelihood of C-section delivery in both smokers and non-smokers. Education programs need to reflect the possible implications and increased risk factors for women with respiratory issues during pregnancy – both associated with and not associated with smoking. Source: Kitsantas P, Christopher KE. 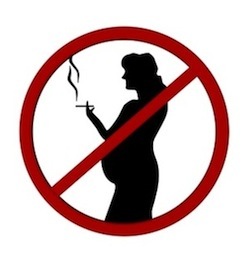 Smoking and respiratory conditions in pregnancy: associations with adverse pregnancy outcomes. South Med J. 2013 May;106(5):310-5. doi: 10.1097/SMJ.0b013e318290c6e8.